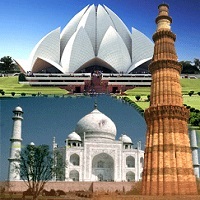 Golden Triangle Tours is one of its kind tours. Such tours present you a golden picture of a particular place and require efforts to plan a proper and comfortable itinerary. Sorting such issues, the experts of HOTEL SHRI SAI MURLI offers you a well-planned Golden Triangle Tour. Our experts are well-versed with the many places that we cater in our tour and can handle the proper management in accordance with time. With us, you can be sure of complete comfort and convenience. Moreover, we ensure you hassle free booking for travel, accommodation and dinning.